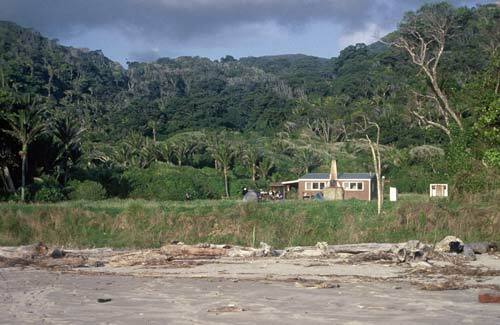 The Heaphy hut, near the mouth of the Heaphy River, has long been a haven for trampers walking the Heaphy Track. Situated on the edge of a lagoon, it is an idyllic place for relaxing, fishing or swimming. The Heaphy River is named after Charles Heaphy, who explored the rugged coastline with Thomas Brunner and Māori guides in 1846. Although the Heaphy Track bears his name, he never travelled inland along it. This item has been provided for private study purposes (such as school projects, family and local history research) and any published reproduction (print or electronic) may infringe copyright law. It is the responsibility of the user of any material to obtain clearance from the copyright holder.